Delta Force Paintball is the world’s largest operator of paintball games. We have revolutionised the paintball industry through our 100% safety record, professionalism, and amazing movie-set quality game zones. Our safety standards are extremely meticulous and are the envy of other paintball centres. We have taken every step possible to ensure the safety of all players, including investing in the latest technology to provide you with a US-spec full head goggle protection system. These goggles, complete with a chinstrap, will protect you from any potential painful headshots. If speaking to our competitors, ask if they provide this level of safety and if not, ask why? At Delta Force all of our staff are highly trained, experienced paintballers who love what they do. They are there to provide you with the ultimate paintball experience and that is exactly what you will receive. Our professional staff have seen thousands of paintball games played out before them, so if you want some advice then definitely do not hesitate to ask. These guys live and breathe paintball strategy and would love to help lead your team to victory! Gone are the days of playing behind trees, hay bales and wooden pallets, which you still find at our competitors sites. Incredible movie-set quality game zones enable Delta Force customers to play on the very best themed scenarios in Australia, including Tomb Raider with Giant Stone Pyramids, the Wild West, Military Check-Point, Gold Mines and much more. 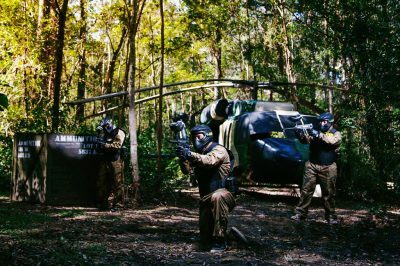 With the most exciting game zones and best equipment in Australian paintball, get your friends together and experience an adrenalin-fuelled day of paintball action with Delta Force! Our world-class facilities, equipment and game scenarios will ensure that you have a day to remember. Delta Force Paintball – revolutionising the paintball industry! To book your next paintball event with Delta Force, please contact our booking office on 1300 850 744.